What lambing time best suits a perennial pasture base with 20% of the farm to lucerne? For spring lambing, is there any benefit of having more than 20% of the farm sown to a summer-active species? More lucerne increases production and profit. Economic modelling of different sheep enterprises using long-term average monthly rainfall data was performed to determine the effect of replacing annuals with perennial pastures, and from using terminal or Merino rams. This modelling used an optimisation approach, that is, what combination of pastures and livestock system would maximise whole farm profit? The Winter Lambing, Spring Lambing and Split Lambing systems all used the same perennial pasture base of 20% lucerne, 20% tall fescue and 60% phalaris (Figure 1). All systems used the same stocking rate (dry sheep equivalents) in July (time of most limiting feed) to enable a fair comparison. 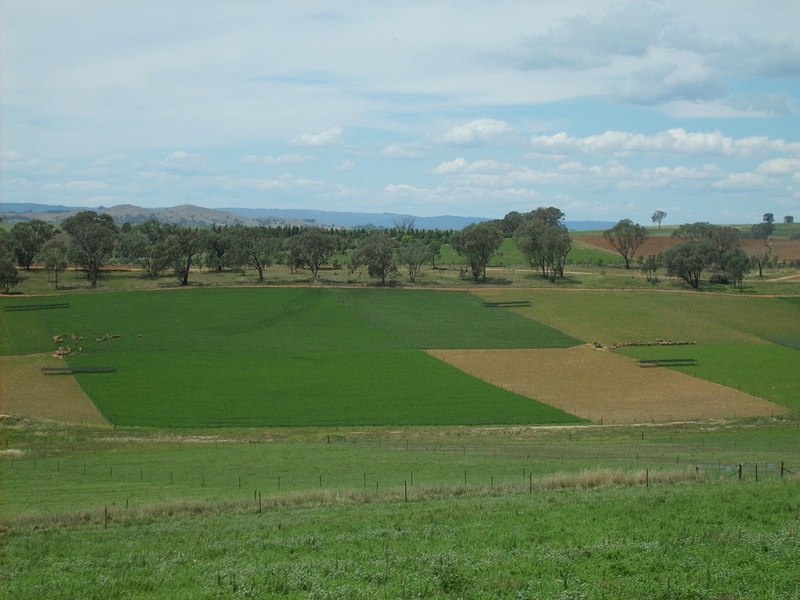 A High Lucerne treatment had the same animal system as Later Lambing but with a pasture base consisting of 40% of the farm area sown to lucerne, 45% phalaris and 15% to tall fescue (Figure 2). Winter Lambing Merino (Control) – The traditional July lambing system with all ewes joined to Merino rams. The objective was to retain all lambs to finish to slaughter weight, dependent on seasonal conditions. 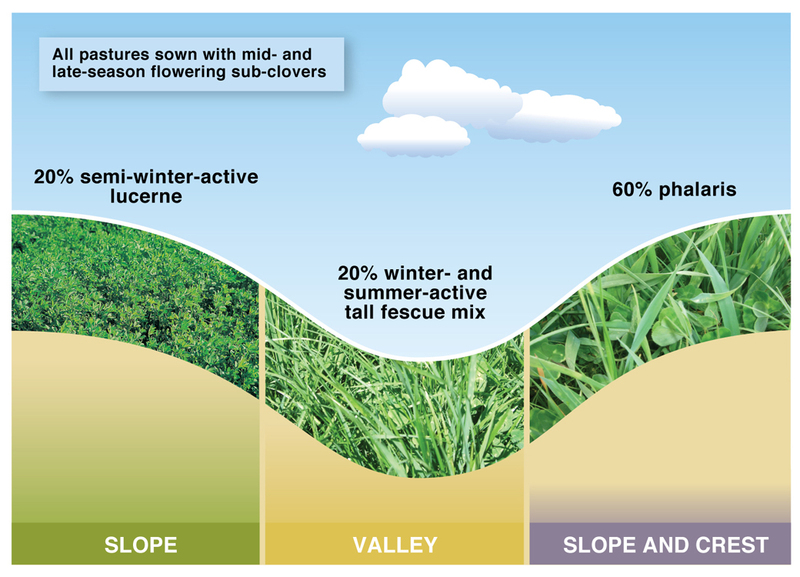 This system was used as the baseline to show the potential for alternative management to increase production where perennial pastures are used. Systems such as this are widely used as the risk associated with the ability to finish lambs is reduced. Later Lambing – September lambing to allow a higher stocking rate to produce more wool and lambs per hectare, while producing some crossbred lambs to also increase lamb production; modelling indicated that both September lambing and use of terminal rams would increase profits. This system joined half the ewes to Merino and half to terminal rams but retained the ability to breed replacement ewes. The system aimed to sell lambs at weaning so only ewes were carried over summer. Split Lambing – Half the ewes lamb to terminal rams in July and the other half to Merino rams in September. A short (two week) joining to terminals was used in February for 60% of the ewes (although based on results three weeks is recommended), those that failed to fall pregnant and un-joined ewes were joined in April to Merino rams. The Split Lambing system allows an intermediate stocking rate, and higher lamb production while breeding replacement ewes. The July-born crossbred lambs can be finished to heavier weights if seasonal conditions allow, or sold at weaning as store lambs in poorer seasons. September-born Merino lambs can be retained after weaning and sold at higher weights if seasonal conditions allow. The use of a higher stocking rate than the Winter Lambing System, and production of crossbred lambs, were both indicated by modelling to increase profit. The use of two joining times was thought to increase flexibility and reduce risk from varying seasons, as a compromise between a low production/lower risk (Winter Lambing Merino) and high production/higher risk (Later Lambing) enterprise. While each system was designed to generate replacement Merino ewes, ewe lambs were not retained within any system in the experiment. The field experiment was conducted under either drought (2006-2009) or extremely wet (2010) conditions, so the performance of the different enterprises may not well represent performance in a more normal run of years. Therefore, using GrassGro modelling, simulations of several sheep enterprises were conducted to allow comparison over a time period of 30 years. Stocking rate, lambing time, and lamb sale policies were tested.